In August of 2016, Stryker, a manufacturer of various orthopedic medical products including hip prostheses (implants) used during hip replacement surgery, voluntarily recalled their Stryker LFIT Anatomic CoCr V40 Femoral Head components. Click here to see Stryker’s notice of voluntary recall dated 8/29/16. This specific recalled component of the Stryker hip implant system, intended to replace a patient’s femoral head, is the “ball” at the top of your femur or thigh bone. 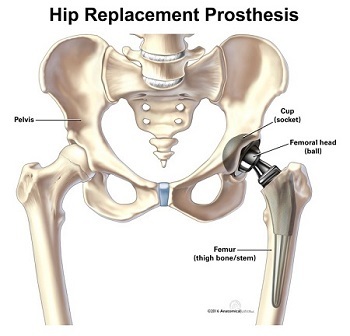 This femoral head “ball” sits in an artificial hip socket or “cup” (see illustration below). The recalled defective Stryker V40 femoral head components were manufactured before 2011 and have reportedly failed in numerous respects causing injuries and potential hazards to implant recipients. Some of the foregoing hazards and conditions may require the need for surgical intervention to revise and/or replace the Stryker hip implant, and possibly may require the need for treatment/monitoring of metallosis. Surgeons who performed the placement of these Stryker hip replacement implants were notified of the recall, and should advise all recipient patients accordingly. However, we encourage all recipients of any Stryker hip replacement hardware to communicate with their surgeons to determine if their hip implants are included in the referenced recall, and to arrange for appropriate evaluation and treatment if necessary. Stryker hip replacement recipients may be entitled to monetary compensation relative to the foregoing issues. Blume Forte has handled numerous defective medical product claims, including those of the nature described. If you or a loved one has received a Stryker LFIT V40 Femoral Head implant, please call us at (973) 635-5400 for an evaluation of your potential claim.